After moving to the U.S. from Romania, Gina Nicolae Johnson shifted her primary mode of expression from writing to painting. With brushes and canvas, Gina is able to communicate emotion free of language barriers. Her beautiful use of color is captivating for her viewers, and her unique style shines through in every piece she creates. She is never afraid to let her imagination guide her painting, and the colorful result is certainly one that encourages love and positivity. Gina Nicolae Johnson - I was born in Romania and moved to the USA in 2005. Writer, journalist, novelist, poet and artist - painter. Author of three poetry books written in Romanian language, a novel in english ("Angels and ghosts in Transylvania"), several art books and "101 Deep Provoking Messages". My first love was writing and then painting, but since moving to the USA and facing the challenge of language barriers, my preferred mode of expression shifted from writing (in my native Romanian) to painting. I realized that painting had become a first priority, but I'm still writing in my native Romanian language and English. I am in love with the canvas and creating with beautiful colors. It is so easy for me to 'write a poem', but instead with a brush, colors, and a variety of media. It makes me feel good about being able to share the gift of art with others. There are no limits in painting. I transfer in my painting everything I have discovered about Love, Humans, Life, Nature, Animals. Painting captivates to the point that I don't even notice the passing of time. Inspiration is abundant, from love for flowers, delight at a beautiful sunset or the ocean, a bird chirping, the sky and a day when I can see colors in front of my eyes. I will have hand painted Christmas ornaments on wood and Fall and Winter greeting cards printed after my original paintings. I was 4 years old, living with my grandparents and painting on a small bench in the house with a wood paint. That turned out to be very beautiful. The originality, bright colors, positivity that is reflected in all of my paintings, the abstract trees, the uniqueness of my paintings and the beautiful, colorful flowers. The original paintings, acrylic on canvas, abstract trees. Every single time I have an art show, my trees are the most desired and sold. Abundance of positive comments and appreciation for my art. My art work is unique because I transfer into my paintings my emotions and I don’t have any barriers in using the colors. I created my own style in art by letting my imagination be free and not absorbed by rules. Art is unique, each artist is different, but I am positive that my art is beautifully unique and apart from others. Every time I exhibit my art, the moments are: “WOW, your art vibrates of positivity, it is so beautiful in here, so colorful and radiant of happiness”. Check out more of Gina's work online, and be sure to stop by her booth at the Minneapolis Gift & Art Expo, November 2-4, 2018 at the Minneapolis Convention Center! 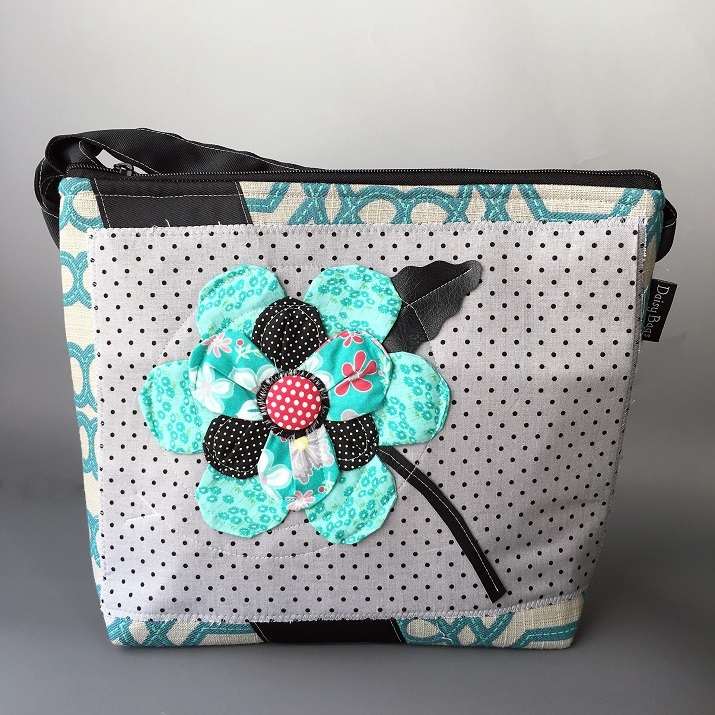 Jill Scales is the creative designer and entrepreneur behind Daisy Bags; she makes her line of handbags and accessories by hand, from the patterns to the final product. Jill got started creating handbags that are unique, durable, and custom made, and her customers responded so well that she expanded her business to be her full-time job. 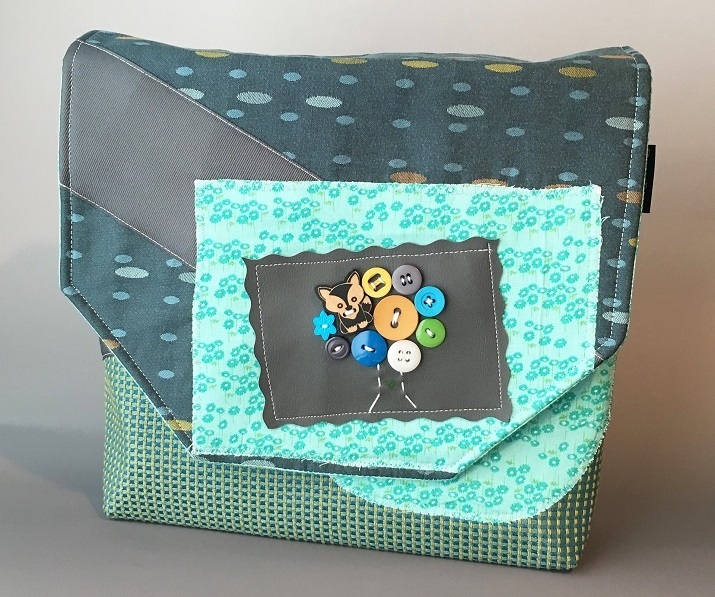 Jill's beautiful work is a special gift for anyone on your list, and a piece from the Daisy Bags collection will be treasured for years to come. Why carry around an ordinary handbag when you can carry a Daisy Bag? I've always loved sewing-in high school I made my own clothes. When my girlfriends started having babies, they all got baby quilts. Sewing has always been a part of my life. In 2004, I was on the search for an affordable bag featuring a photo of my first "baby"-a black Labrador retriever named Daisey. I found one -- for $200. Rather than fork over that much cash, I decided to just make one myself. I took it to work and everyone loved it. Timing was perfect--it happened to be right before Mother's Day. Handbags with pictures of children, grandchildren, pets, and loved ones were the perfect gift idea. Several orders where placed and Daisy Bags was launched. I left my retail management job that fall to create and design full time. During the past 14+ years, Daisy Bags has evolved into a multiline handbag and accessory company for the whole family. Each design and bag is still made by me in my Elk Grove Village, IL home studio. I sell on my website, have an Etsy shop and spend my weekends May-December selling at 20-30 art shows a year. I also take full advantage of social media (Facebook, Twitter, Pinterest) to connect with customers. Daisy bags has allowed me to do what I love for a career at home, all while raising a 13-year-old daughter, 11-year-old son and of course my 15-year-old Daisey. What's the latest thing you've been working on? My latest creation is the reusable straw bag. People are starting to realize how much waste is created from the disposable straws we use at coffee shops, restaurants and even at home. 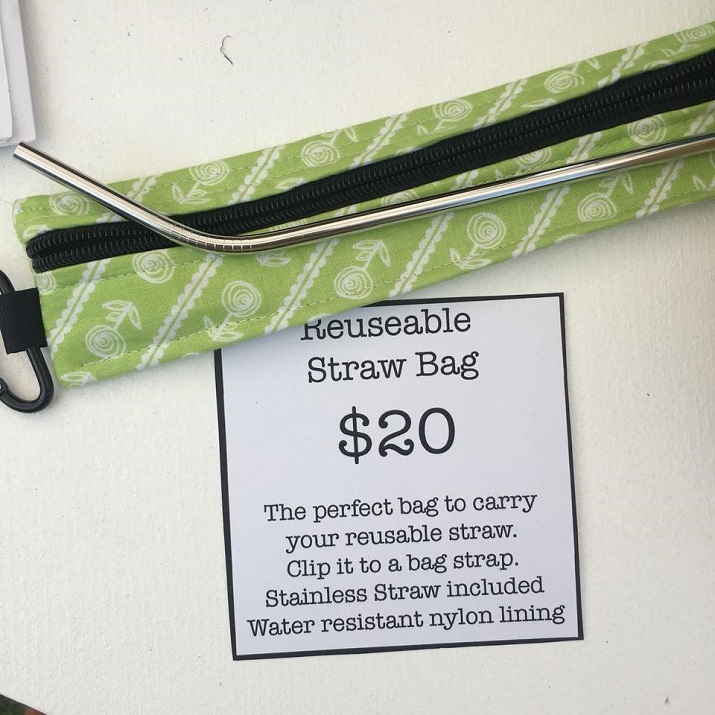 I created a bag to hold your reusable straw. Now you can carry your straw bag to all your favorite spots and help save the environment. A stainless steel straw is included. Customers love how long my bags last. They hold up against years of use. I joking tell them “I need to make my bags fall apart after a year, so you have to buy a new one.” I have customers come back with bags 10+ years old. I always love seeing the “vintage” Daisy Bags. Creating functional pieces is what motivate me. 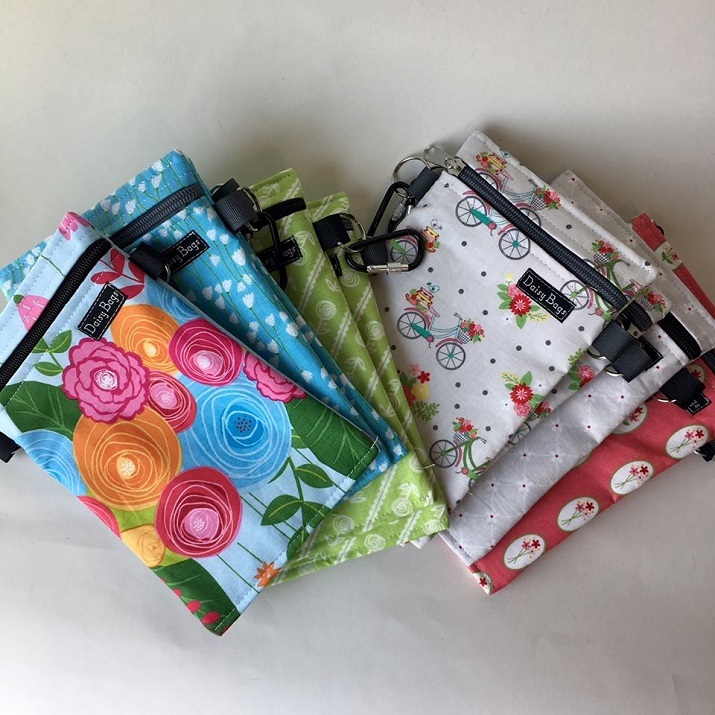 I see a need in the market (ie reusable straw bag, trash bag for the car, cell phone keeper) and I create a bag to fill that need. The keeper and car trash bags are one of my most popular accessories. I think the reusable straw bag will be the top item for this holiday season. I create all the designs myself. Each bag is hand cut by me, not using a pattern. I mix and match fabrics to create a unique look that is very different from my competitors. The appliqué flowers and the buttons trees are 100% Daisy Bags. No one else creates anything like it. Check out more of Jill's work online, and be sure to stop by her booth at the Minneapolis Gift & Art Expo, November 2-4, 2018 at the Minneapolis Convention Center! Cutting Boards Wisconsin creates high end, eco-friendly cutting boards from corian, and durable material that Coby and Denise salvage. Read more about their remarkable cutting boards and how they got started in their business. "We are Coby & Denise the entire workforce of Cutting Boards Wisconsin. We consider ourselves to be a somewhat recycled old couple who uses upcycled (fancy word for " cutoffs headed for the landfill") new solid surface material to create beautiful & long lived cutting boards. We garage craft them in the beautiful boonies of northern Wisconsin. So that's how Cutting Boards WI came to be. We're very proud of what we've accomplished and extremely proud of our cutting boards." Check out more of Coby and Denise's work online, and be sure to stop by their booth at the Minneapolis Gift & Art Expo, November 2-4, 2018 at the Minneapolis Convention Center! A handmade piece from Jeannie Trelles' line of sterling silver and semi-precious stone jewelry is so much more than a necklace or ring. Vikse Designs is an extension of Jeannie's love for creating, years of practicing her skills, and the thought she puts into each individual piece. Her newest endeavor is cutting and polishing each stone herself before crafting the perfect setting for them, which is a true testament to the care she takes with each step of her process. My name is Jeannie Trelles, and my business is Vikse Designs. I am a silversmith and lapidary artist. I specialize in one of a kind sterling silver and semi-precious stone jewelry. Lately I have been working on making necklaces and rings featuring stones that I have cut and polished myself. This is one of my newer skills, and I am excited to use materials that I have seen through the entire process of shaping the stones and creating the settings. The first jewelry that I ever made were friendship bracelets when I was in second grade. I started out with a kit, and from there I changed the patterns and came up with my own designs. I have always been creative, and have tried many different types of arts and crafts over the years. Jewelry making has been a way to combine all of my different creative interests. I think that they love the variety of the natural stones that I use. The stones are the focal point of my designs, so I am always on the search for really unique pieces. I think they also appreciate the quality of my workmanship. I love being able to meet and interact with my customers. I put my heart into my work and become very attached to some pieces, and I really like to meet the people that will be wearing my jewelry. It just wouldn’t be feel the same if a really special piece sold in a store and I never got to meet the buyer! In addition to making and selling my jewelry, I am also a cello teacher. I have a Master’s Degree in Cello Performance and a full studio of private students. I love the balance of my two professions. I first started making and selling my jewelry when I was in high school. At the time, I was making jewelry from seed beads and selling to friends and family. When I was in college, I started selling my work at a coffee shop that I worked at. About 10 years ago, I started looking for more places to sell, and turned my hobby into an official business. Each year, it has continued to grow, and as I have learned new skills, my style and materials have changed. My business name, “Vikse”, is my maternal grandparents’ last name, and my middle name. It is Norwegian. When I started my business, I wanted to use my name without using my first or last name. This was also a way to honor my grandparents, as my grandmother was a huge influence in many of my earlier creative endeavors, having taught me to crochet as a child. Check out more of Jeannie's work online, and be sure to stop by her booth at the Minneapolis Gift & Art Expo, November 2-4, 2018 at the Minneapolis Convention Center! Author K Hanson takes his readers to far away places with captivating storylines and relatable characters. His thriller and fantasy novels tell stories of brave young heroines and the extraordinary cicumstances they find themselves in. His novels are the perfect gift for the bookworm in your life! I am K Hanson and I am an author of Thriller and Fantasy novels. Currently, I have two active series. My thriller series, including The Azrael Initiative and Morgan is Missing, focuses on modern issues, such as terrorism and human trafficking, and I hope to educate the reader a bit as I entertain them. My fantasy series, starting with Storm Raven, is about a sassy pirate captain named Nereyda who discovers a source of magical abilities. I’ve also started cooking up a dystopian urban fantasy series, but I’m a couple of years away from launching that. I’m working on launching Morgan is Missing, the second book in my thriller series and editing the next book in my fantasy series. I’ve also started doing research for the third book in the thriller so that I can start drafting that soon. As a slow burning project, I’ve also started laying the groundwork for a new dystopian urban fantasy series as I work through a writing course that I am taking. Having three projects at various stages keeps me busy, but the variety is exciting! From what I’ve heard, I think people enjoy my characters the most. I strive to create well-rounded characters who behave realistically, even when they are in extraordinary circumstances. This makes them more relatable and representative of what real people might do. Don’t tell my other series, but I think I have a soft spot for Storm Raven. The main character, Nereyda, is my favorite character that I’ve created. It is incredibly fun to write a sassy, badass pirate captain. I’ve had story ideas in my head for years and, one day, I just decided it was time to write them down. So, I read some books on writing novel and got started. I found that I really enjoyed creating worlds and characters, then taking them on adventures. As I’ve actually written my books, the stories have improved and evolved, but it is very satisfying to finally turn abstract concepts into something concrete that people can experience. My home city of Sioux Falls is a major influence in my work. The main character of my thriller series is from Sioux Falls, while her best friend is from Minneapolis. My upcoming dystopian urban fantasy series will also be set in Sioux Falls. Outside of the stories themselves, I’ve become involved in a blossoming writing community here in Sioux Falls, and that has really helped me grow as a writer. My full name is Erik Hanson. However, my best friend since middle school and my roommate in college is named Eric Hanson. In fact, we also share the same middle name. Because of the single letter difference in our names, our friends call me “K” and him “C”. Since it was already a nickname, I figured I would just roll with it for my pen name. Check out more of Erik's work online, and be sure to stop by his booth at the Minneapolis Gift & Art Expo, November 2-4, 2018 at the Minneapolis Convention Center! Black Gecko Books are the work of young artist, Molly Friesen, who discovered book arts for a school project and has been creating her own books ever since. She mindfully crafts each book by hand, from the decorative paper to the intricate stitches used for binding. Bookbinding is a rare artform in this digital age, and Molly is working to create handmade books that can be treasured for years to come. My name is Molly Friesen, I am currently 19 years old, and have been binding books for the past four years. Though I do dabble in other leather crafts and painting, I mostly work on books. They are my most satisfying project to do. Some of the other art I do includes alcohol ink painting and drawing Celtic Knots. My Great Grandmother, a wonderful woman who's a professional artist herself and has won many awards, taught me how to pain with alcohol inks, which is an alcohol based ink that, when used on different papers and mediums, reacts in very beautiful ways. A friend of mine in high school taught me how to draw Celtic knots, and I probably spent too much of my time in class drawing instead of paying attention. The first time I bound a book was for a class project. The assignment was to write a journal in the perspective of someone suffering from the black plague. I, of course, decided to do way too much for a basic project, and bound a small book to write the journal entries in. It was a difficult process for my first books, but I was very pleased with the end result. It looked pretty good, for my first time trying to bind a book. After that project, I continued to practice book making and different binding techniques. I discovered that my favorite method was Coptic stitch, which is what I mostly use today. In 2013, my art teacher suggested I try out the Uptown Art Fair Youth Show. It was my first experience selling any of my art, and it was amazing. Seeing so many people, strangers, excited about my products and happy to buy them was a great feeling. People loved my books and I nearly sold out. I loved seeing how excited people were to see the handbound books. People were amazed that I drew all the Celtic knots by hand. And people couldn't figure out how I had made the alcohol ink paintings, which is a medium that isn't very widely used. Since then, I've done one or two art shows a year, but my first show has definitely been my biggest and most profitable one. My original business name was Inks, Books, and Knots, because that was what I mostly made. I've recently changed it to Black Gecko Books, which I personally like a lot more. I make more books than anything else currently, and that's what I enjoy making the most. I also have a wonderful pet Leopard Gecko who is currently four years old. I've had her since she was just a hatchling, and she is a wonderful pet. She crawls around my desk while I'm working, and I have her pose with my books like a tiny lizard model. Though she is not black, she does have black spots. The name Black Gecko Books has a lot more meaning to me than Inks, Books, and Knots. My motivation for creation is the satisfaction of completing a project. Not every book I bind is perfect, or exactly how I wanted it to turn out. But each one is a joy to make, and when I finish, I'm always happy with the end result. The time and effort I put in to each books is totally worth it in the end. Even if my stitches are slightly off, or my pages shifted during binding, I love every one, and their differences just make them unique. Of course, I'm not happy with every book I make, but I'm just able to learn from my mistakes and make an even better book the next time around. Check out more of Molly's work online, and be sure to stop by her booth at the Minneapolis Gift & Art Expo, November 2-4, 2018 at the Minneapolis Convention Center! Artist Terra Rathai has a unique perspective when it comes to her work as a photographer; she loves to highlight the beauty of everyday subject matter, but it's anything but ordinary. Avant Garden Studio has everything from traditional fine art prints to lovely home decor and stationary products that feature Terra's reverence for the natural world. Her eco-friendly materials of choice are salvaged wood and recycled paper, and once her stunning nature photographs and special quotes are added they certainly take on a new life. My name is Terra Rathai. I am a Minneapolis-based fine art and garden photographer. I create work that expresses the extraordinary beauty and interest in ordinary, everyday subject matter. In addition to traditional fine art prints, I offer a line of home decor and stationery products featuring my original photographs, often paired with inspiring quotations and bits of poetry. My product line is earthy and eco-friendly utilizing salvaged wood and recycled brown kraft paper. My approach to photography is unique. My customers often comment on the calming effect of my work or the way that my vision helps them to see beauty in their own everyday world. That’s my favorite compliment! People like my wood photo blocks; they are a unique way of presenting photography and, because they are handcrafted from salvaged wood, every block is unique. Many customers also love the quotations I incorporate into my cards and journals. Short answer: YES! But, I quickly gave up on the idea of being an artist. I chose, instead, to major in Art History. I now see how studying art and being exposed to thousands of images has influenced the way I see the world. It’s a big part of how I make my images. I love meeting customers, hearing from people who have purchased my work before and, most of all, seeing how people respond when they walk into my booth. The best reactions are a sort of gasp, followed by a big sigh and comments like, “I want to live here!”. It’s also fun to work directly with people to help them find the perfect gift or grouping of images. My favorite item would have to be my handcrafted wood photo blocks. I love them because they are a cool, unique and earthy way to present my photography. But more than that, I love them because my dad makes them! It’s been an incredible blessing to have my dad’s help, expertise (he’s a retired carpenter), enthusiasm and massive generosity. Dad enjoys salvaging wood; he’s made blocks out of everything from old knotty pine we found in a dumpster, to an old door from my house, to ripping boards from fallen trees in his yard. His creative sourcing and skilled craftsmanship make each block truly one-of-a-kind. My process evolved when I committed to a 365 project in 2010 and started a blog (avantgarden365.wordpress.com) where I published a photo every day throughout the year. I developed a way of being present and actively seeing my environment. I’ve grown to love the meditative nature of this process and the challenge of recognizing beauty in familiar subjects. Check out more of Terra's work online, and be sure to stop by her booth at the Minneapolis Gift & Art Expo, November 2-4, 2018 at the Minneapolis Convention Center!